This quilt has a simple block structure. The concentric circles painted on fabric by the artist represent the dots used in traditional aboriginal art in central Australia. Other squares have fabrics with dot painting designs purchased in Australian textile shops or indigenous cultural institutes. The tribe’s claim of intellectual property rights to the commercialization of such designs has sparked much discussion and litigation in Australia. The piece also contains blocks of fabric made by Mandy Muir, an aboriginal artist in the Northern Territory using the X-ray style for animal and plant representations common to bark paintings there. Muir was the director of Daluk Daluk (“women’s group” in the Gun-djeihmi language), a women’s organization of the Gagudju Association engaged in the screen printing business making clothing and wall hangings in Kakadu National Park. We stopped at the business when we stayed at the hotel in Kakadu. Mandy, who had designed the hotel’s wall hangings, sold us scraps of her fabric for use in Patricia’s quilts. The black blocks tend to be above with red blocks below and yellow ones centered, particularly yellow used in the artist’s dots toward the center of the quilt. This echoes the aboriginal flag, which consists of a yellow circle centered between a black block above and a red block below. 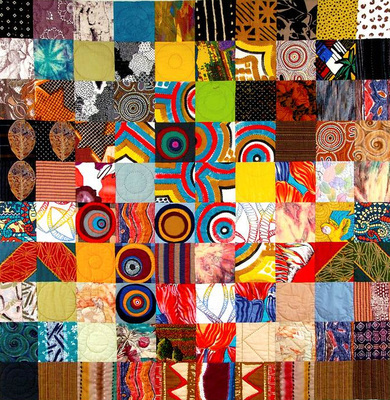 The brown and blue colors suffusing the quilt suggest the bush and the ocean surrounding the continent.